go fast. If you would like a set please let us know and Mary can carve a specail set just for you. Right now these little guys are the only Bass Wood carving Mary has completed for this season. More are coming! 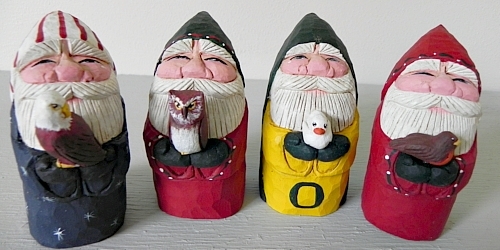 These unusual Carved Santas are designed by hand from from either Bass Wood or Sugar Pine. Mary takes great care in planning, carving, and painting each wood carved Santa. Each Santa Claus is different, original, and totally unique. Mary's wood carvings are beautiful, creative, and generate a feeling of Christmas in the heart of their owners. Mary's pieces are collector's items and add to the excitement and joy of the holiday season. Mary Elton Wilkerson has been involved in wood carving for over 30 years and takes great pride in her art. While attending Cal-State Fullerton where she received Bachelors degree in art she started her carving career. She loves to take a piece of wood and carve it into a unique Santa Claus or other original pieces of art. 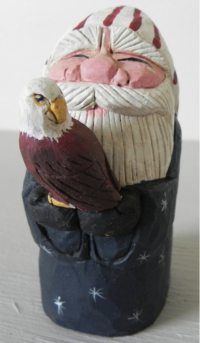 Mary has collectors all over the United States for her hand carved Santas, Snowmen, and other Christmas related pieces. Hand carved wood has been Mary's passion for many years. 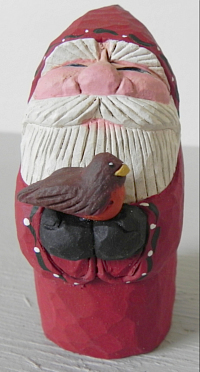 We are certain you will cherish your own personal hand carved Santa from the hands of Mary Elton Wilkerson. Mary's Santas make great gifts for any occasion. can design one especially for you. Mary will be more than glad to help you with special orders Just contact us and we will work out the details for special orders. 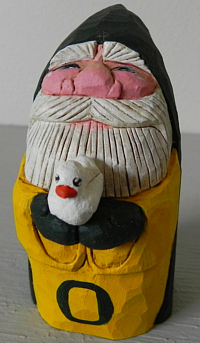 Each carved Santa in this gallery has a special page dedicated to its description and price. All you have to do is select the Santa you would like to view in a larger image and click. These special pages also have information about the Santa, prices, and ordering information. 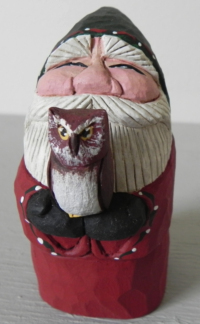 Take your time viewing Mary's hand carved Santas and if you have any questions please contact us today. In addition to our contact page we have a page dedicated to customers service and secure payment and privacy. We Do Accept all Major Credit Cards Through Paypal. You do not have to open an account in order to purchase our products through PayPal. We want to make your purchase easy, safe and pleasant. In addition, we have a 100% satisfaction return policy. To learn more about our policies visit our customer service page.